Sometimes people aren’t quite sure what klezmer exactly is, where it comes from or how to play it. It has always attracted me incredibly: its rhythms provoking me and melodies ringing in my ears for days. I decided to undergo a little investigation, I read a lot about it, and I played in two klezmer music groups afterwards, to absorb its atmosphere. 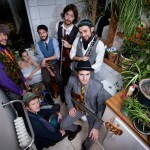 The meaning of the word “klezmer” hasn’t always been the same; it has evolved and changed much in the same way as the Jewish folk music mixed with influences from the neighbouring nations and their cultures. 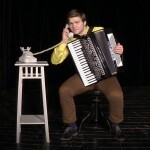 Originally, it meant a musical instrument, later it denoted the musicians themselves, and only since the second half of the 20th century it is used to describe a musical genre encompassing folk music of Eastern European Jews from the regions of Ukraine, Hungary, Poland, Belarus, Lithuania, Romania and Slovakia. 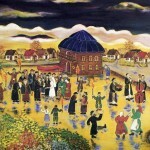 The following song, Sprays de mir, is an typical example of the klezmer repertoire. 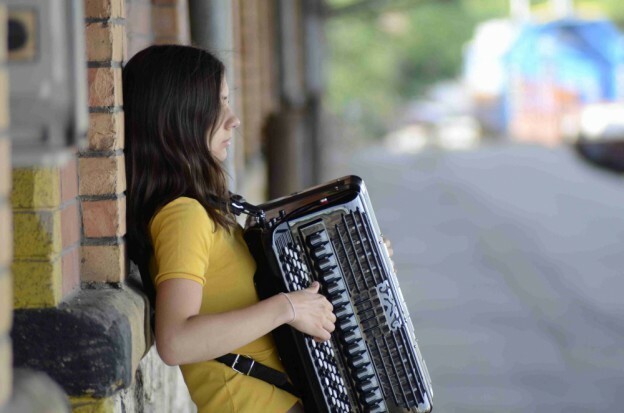 Sprays de mir was played at the accordionists’ workshop at the beginning of August 2014. When I was asked – as an instructor – to make ready two songs, I didn’t hesitate long and chose my two favourites. 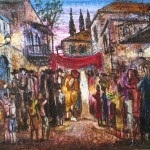 One of them was the sad song Kačenka and the second one this Jewish folk song. Like any “standard”, Jewish or other, each group interprets it differently – not to mention playing it solo! There are many, many possibilities, especially regarding tempo, melodic ornaments, improvised intermezzos or accompaniment. First of all, it’s important to learn the melody without any ornaments. tempo – traditionally, it is slow first and then becomes virtuosic. In the half of the song, it can drop back abruptly and unexpectedly as a reminiscence of the beginning, and then jump again to the quick mode. Let yourself be inspired by my version, but don’t forget to play from your heart and add your own musical elements. There’s no limit to fantasy and improvisation! You can, for example, add a moaning solo in the middle, so typical of Jewish songs. Good luck! 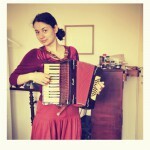 Accordion has accompanied me since my first class at the basic school. I’ve gained a lot of valuable experience at the Prague Conservatory, from which I draw until today. Since the third year of the conservatory, I and the flautist Markéta Ivachová have organised chamber concerts in our home towns and played at holiday festivals and exhibitions. We call ourselves Duo Colors and you can listen to our renditions of compositions by A. Piazolla, C. Bolling, D. Scarlatti, F. Angelis, A. Honegger and many others in a programme about the Prague Conservatory in the online archive of the Czech Television. After a year and a half at the Academy of Performing Arts in Bratislava, I was attracted by the friendly, unrestrained and experimental atmosphere of Brno. 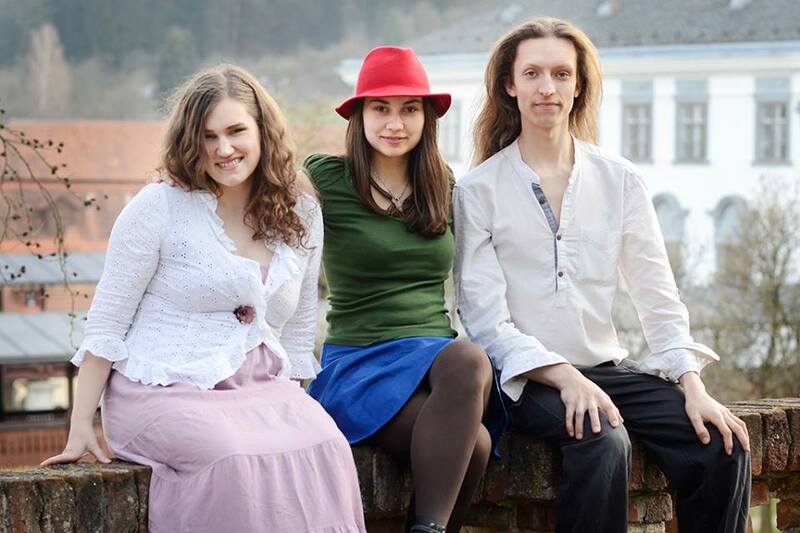 I met the didgeridoo player Dalibor Neuwirt there, together with whom I’ve founded a musical project Vlčí Mág. We try to combine accordion music with the sound of the traditional Australian wooden instrument particularly through breathing and rhythm. We’ve been joined later by the opera singer Alexandra Polarczyk; Matouš Vinš, a photographer and musician, accompanies us sometimes as a guest. 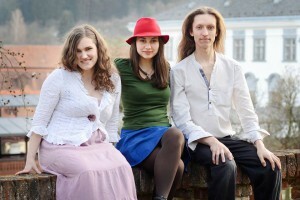 We’ve already performed outside Brno and we also published a CD with recording from our concerts recently. Currently, I study at the Conservatory of Jaroslav Ježek in Prague, teach at the Art School of Pavel Hokr in Prague and also give individual lessons to the public. Listen.